I thought we might get a break from the feels this week, considering what episode 300 has in store for us. I was hella wrong. This episode was a rollercoaster ride in all of the best ways. Let’s get to it! 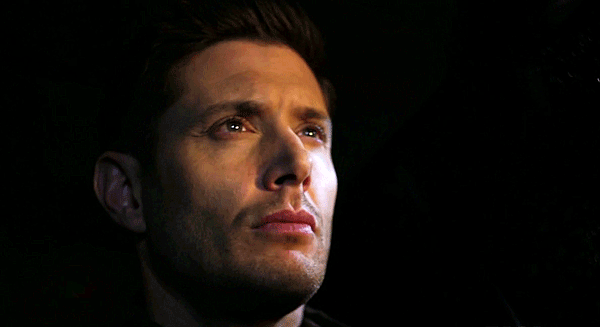 I’ve said it before and I’ll say it again: Jensen Ackles is one of the most underrated actors in television history. 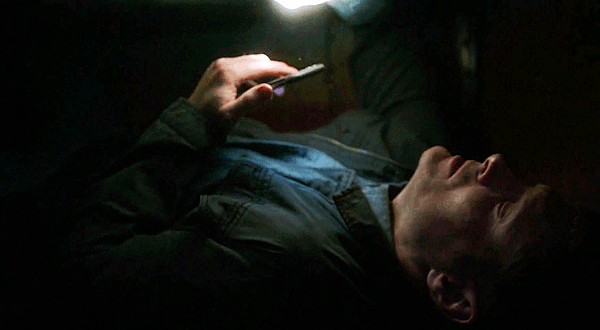 When we opened on Dean at the bottom of the ocean in the Ma’lak box, panicking and freaking out, calling for Sam, his fingers bleeding from trying to claw his way out, my heart was pounding. 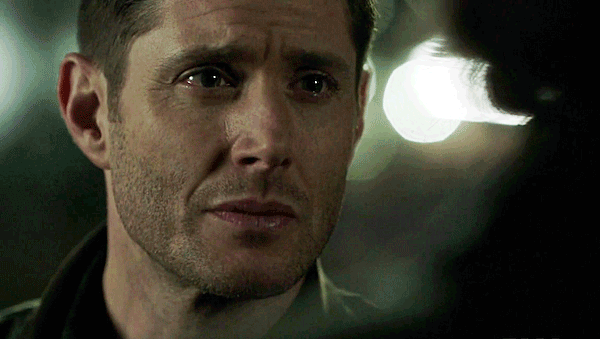 Ackles’ face showed so many emotions at once, and all of them brutal and authentic. I actually found myself saying “No no no” aloud in anguish, I was so gut-wrenched at the sight of it all. Ackles. Emmy. Period. 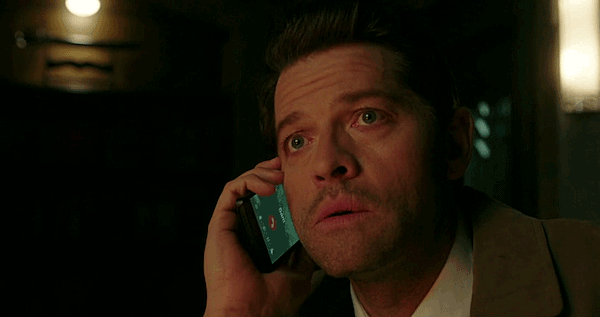 I was worried that the screen was going to flash “48 hours earlier” or something, and that the beginning of the episode was actually the end, but thankfully for me (if not for Dean’s nails) it was just a horrible dream. A lovely little broment begins, where Sam tells Dean it’s okay to be scared, and Dean, painfully (and oh, don’t those eyes convey pain) says, “Never said I wasn’t scared. But it doesn’t matter.” Ouch. Sam recaps the picture (thanks, Sam) but doesn’t have any other plan to offer so Dean is still resolute. He’s going in the box. The case this week, a malformed prophet that came to be due to Donatello’s questionable state that is killing people gruesomely in what he thinks is the name of God, was another example of pushing the boundaries of the terror and bloodshed that this show gets away with at 8:00 pm on a weeknight. 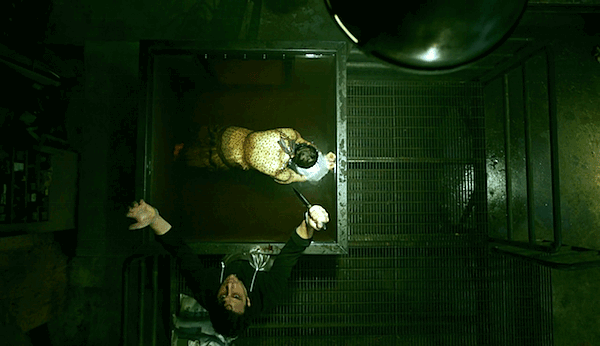 I found the murder scenes truly disturbing, thanks to some fine acting and editing. Was it over the top? Maybe. But it certainly was effective. 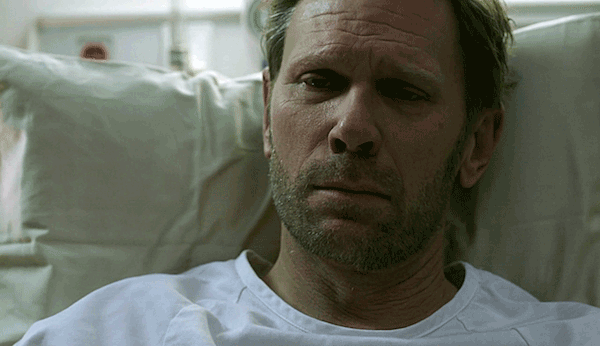 I apologize again in advance but Nick’s story, in my humble opinion, despite Mark Pellegrino’s acting ability, has gone on way too long. I feared he would escape the cocky talking cop, and he did, with another macabre scene where, even though the cop is in capacitated, Nick kicks his head in repeatedly to show he’s thoroughly evil. 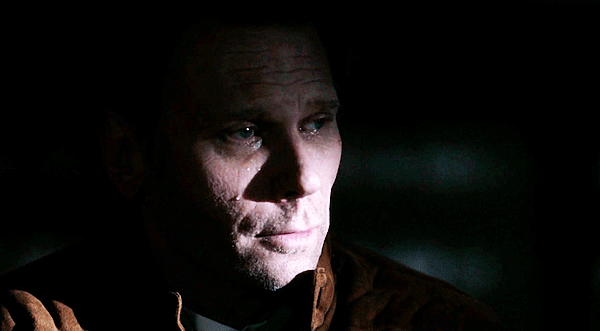 I don’t know where Nick is headed this season, but it has me honestly praying for Lucifer’s return (as much as that would scoff in the face of Dean’s sacrifice) just so I can care about him again. Dean keeps trying to convince Sam that he’s doing the right thing as they drive the Ma’lak box to wherever they plan to dump it. 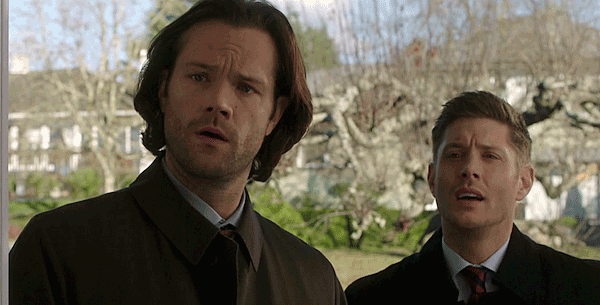 Sam, the little tattletale, calls Cas who knows the score. 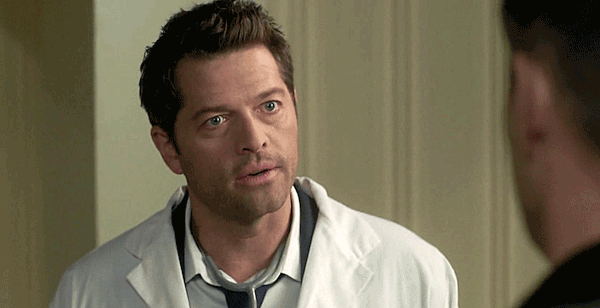 Cas has been unable to find anything to force Michael out, and when he asked Rowena to try the Book of the Damned multiple times she proves she “has a remarkable command of profanity” (Ha!). Both of them know if they don’t find another way, Dean’s gone. And that shakes them (and us) to the core. 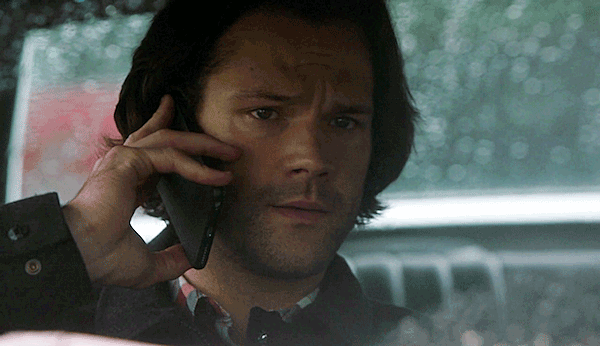 Dean talks to Sam as they drive, confessing he wasn’t always the greatest brother to Sam, who rebuffs him with the knowledge that Dean was the only one who was always there for him and practically raised him (cue the waterworks). As Dean goes on about the times he wasn’t—couldn’t—be there for Sam, Sam realizes that he is making some sort of death bed confession, and Sam isn’t having it. Another painful broment in this episode that Ackles and Jared Padalecki acted the hell out of. Still, their talk of dad, and their past as children, sets us up nicely for the next episode, and is anyone else as excited for episode 300 as I am? Taking “one last case for the Winchester boys” begins the chase for the rogue “prophet” and they figure our pretty quickly who he is and why he’s doing what he’s doing. Cas, ever not subtle, is so happy to hear the boys are working a case, until Dean lets him know this is just a side trip. Cas lets the boys know that the murderer, Antonio Alvarez, was next in line to be prophet but that Donatello’s state has screwed things up and Antonio is premature and may be malformed, causing his misguided violence. Dean calls the hospital and Donatello is still alive. Curious. The boys bust into Alvarez’s apartment and see more Enochian written on his walls than they ever had on their rib cages. Mixed in is English, detailing the scripture behind the murders, and tipping them off to how the next vic is going to die. It’s always a thrill to see the boys put the pieces of a puzzle together. I loves me some Winchesters on a case. They find the location of the next murder and set the vic free just in time. They are really physically rough on old Tony Alvarez, and I must say, I thought it was a bit excessive considering Alvarez was essentially mentally ill. Which he proves by realizing what he’s done and killing himself before the boys can stop him. 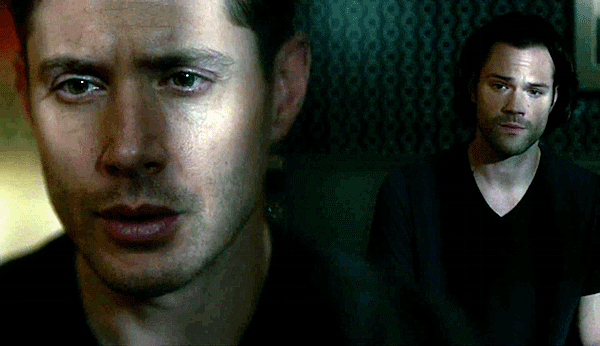 It’s so character revealing how Dean remains stoic in these moments, while Sam looks away in pain and disgust. Dean is Sam’s rock. So what will happen when he’s gone? The boys figure out that Donatello has to be dealt with to prevent a long line of deformed prophets from rising. 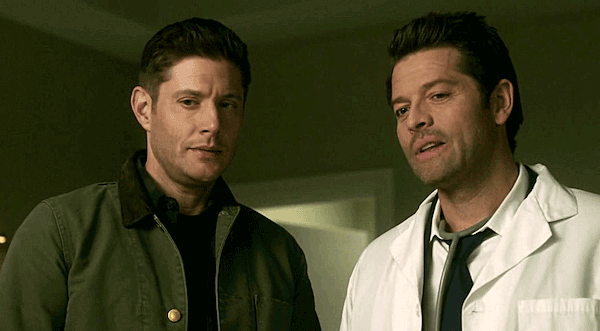 Originally they want to take him off the machines, but Cas, who has infiltrated the hospital as Doctor Novak, wants to try one last time to save Donatello, who may have more brain activity than they thought. 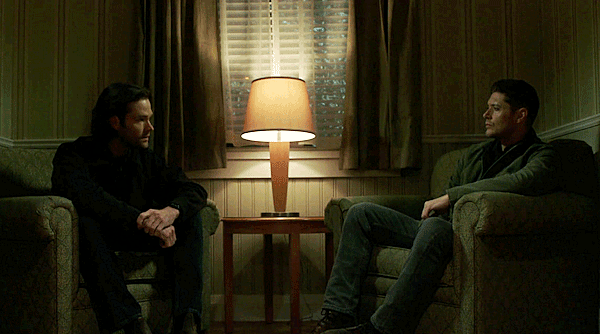 The boys chat in the hall for a moment, and Sam tells Dean it is hard to think about someone being trapped in their own body, so Dean tells him, simply, “Then don’t. Thinking? Highly overrated.” “Easy for you to say,” Sam says. “No, it’s not, actually,” Dean replies softly. And I love how the writing and Ackles’ performance reminds us that the one this is hardest on isn’t Cas or Mary or Sam—it’s Dean. He’s trying to be strong for all of them but he’s the one who is going to have to suffer. They really need to remember that. Sam leans on Baby, drinking a beer, ready to celebrate—briefly—with Dean. And thus begins a wonderful scene I wasn’t expecting, that tightened my throat and made me love these boys even more, if that was possible. 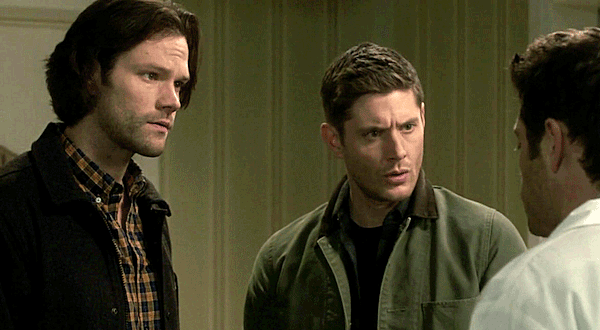 Dean muses that it’s kind of nice, going out on a high, and Sam’s frustrated rage spills out. How dare Dean give up. Say everything means nothing. Give up on faith and family. “We’re the guys who save the world. We don’t just check out of it!” Sam spits, shoving Dean a little, and we can see how close he is to breaking, thanks to Padalecki’s superb acting skill. Dean tries to remind Sam that it’s his only move but Sam will have none of it, and tells him he’s quitting, and how can he do that as they have just witnessed someone who wouldn’t give up and was saved? 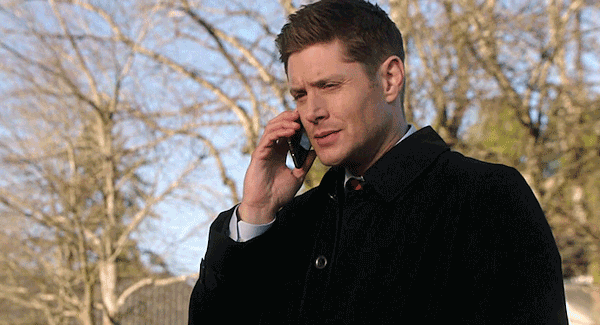 “I believe in us, Dean,” Sam says, upset, and he slugs Dean a good one. 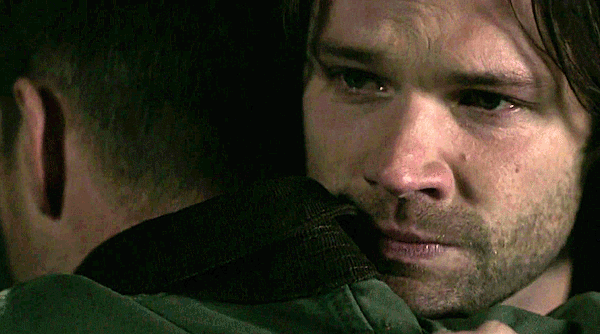 “I believe in us!” Sam says, and makes to swing again, and Dean, instead, pulls him into a desperate hug. “Why don’t you believe in us too?” Sam manages to get out, eyes filled with unshed tears. 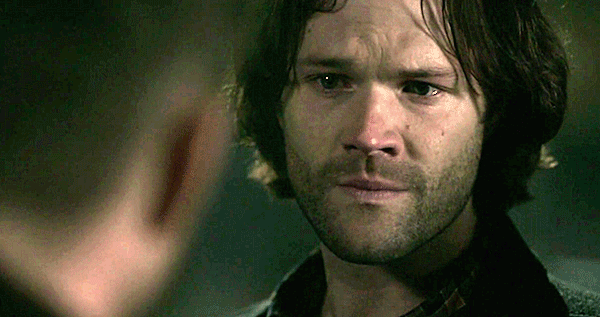 And as Sam’s face changes back to scared little brother, and Dean’s eyes fill with the resignation that Sam needs him and he must give in, I have to admit I teared up myself. “Okay, Sam,” Dean says. 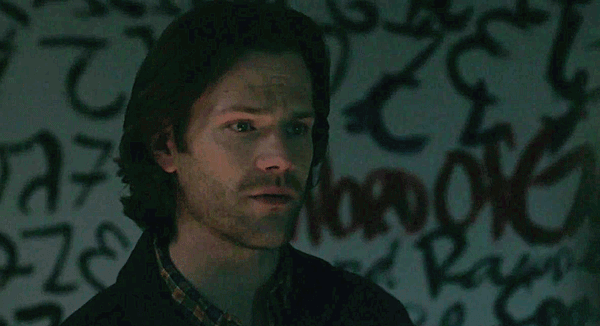 “Let’s go home.” “What?” Sam asks, stunned. Dean says that maybe Billie’s wrong, and he does believe in them—all of them, Cas included—and he’ll keep doing so until he can’t anymore. ‘Til there’s absolutely no other way. And when—if—that time comes, Sam needs to let him go. Cas, too. Sam, grateful for another chance, agrees to it. “Now you heard me,” Dean says. “Let’s go home. Don’t hit me again, okay?” and, thankfully, they only metal contraption Dean gets into is Baby, as they all head back to the Bunker to try again.